Adding to our built-in splash page capabilities, Meraki APs now feature SMS-based splash authentication. It’s quite straightforward. 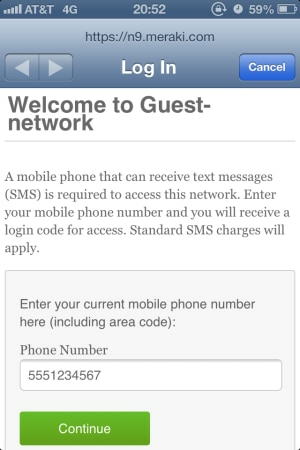 Users connect to the wireless network and enter a mobile phone number. Then they receive an authorization code via SMS, and once they enter the code into the splash page, they’re granted access to the network. With SMS authentication, a business can provide self-service connection to guest wireless without having to manually verify that only real people are trying to connect. We’ve done the heavy lifting of integrating WiFi access with SMS, and every user should be quite familiar with receiving a simple text message. A mobile phone has never been so handy. Naturally, configuring an SSID for SMS auth is done with a single click (or radio button in this case). Users connecting to the network will see a splash page that asks for a mobile phone number. 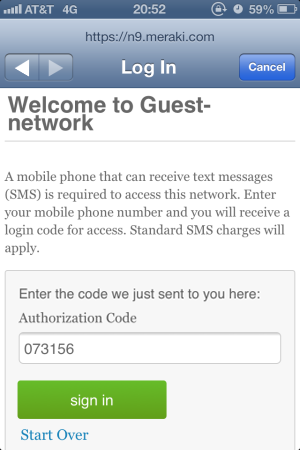 Meraki’s system then sends a verification code via text message to the mobile number, and the user enters the code into the splash page to get access to the network. Client details, including the phone number used for the SMS authentication, are displayed on the client details page. 25 free text messages are included so you can try splash pages with SMS authentication. After that, just configure your Twilio account information in the Network-wide settings page, and your Twilio account will be billed for the text messages sent to users using the SMS-based splash.